Just plug in the USB cord for power and plug the 3.5mm jack into your audio device and the speaker set is ready. Perfect for home, office, kitchen, basement etc,. 【DOUBLE BASS】With JELICH computer speaker, you not only get clear audio but also easy access to high and low sounds. Built-in two subwoofer multimedia speakers (3W x2) fully meet the needs of gamers and music lovers. 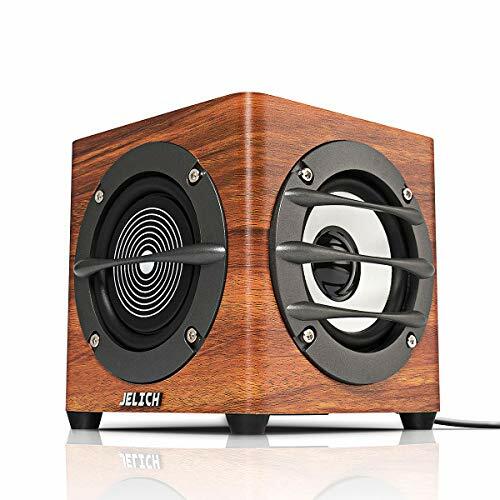 【CLASSIC WOOD FINISH】100% wooden enclosures to minimize acoustic resonance, Magnetically shielded speaker. 【PLUG AND PLAY】USB powered with 3.5mm audio jack connect speaker for audio streaming from your PC or laptop to providing you soft or powerful sound. 【PERFECT GIFT】4.7" X 4.7" X 5" allows the speaker to easily sit on your desk, perfect for home and office. It's time for a perfect gift for your loved one. 【JELICH 100% SATISFACTION GUARANTEED】30 days Return & Refund policy WITHOUT hassle; Get the full refund quickly or free replacement if you aren't completely satisfied; Free lifetime technical support and 12 months manufacturer's warranty. If you have any questions about this product by JELICH, contact us by completing and submitting the form below. If you are looking for a specif part number, please include it with your message.